The story behind Jeffrey Yang and Kazumi Tanaka’s collaboration “No Home Go Home / Go Home No Home,” a series of poems and drawings in our Summer 2017 issue. 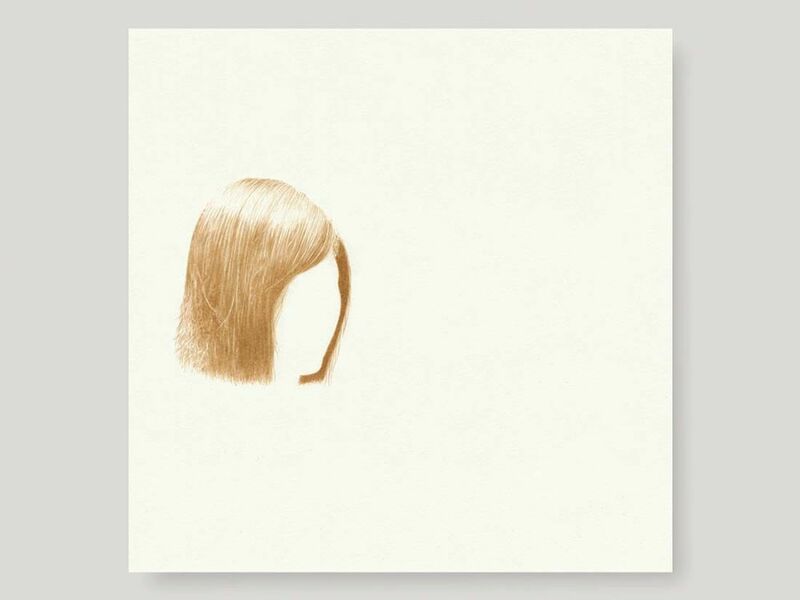 Kazumi Tanaka, Girl, 2007, oolong on paper, 10″ x 10″. Kazumi Tanaka works with wood, bone, sound, and her own hair. She works with plaster, glass, paint, and light. She’s remade the furniture of her mother’s only “tiny corner of … comfort space” in miniature—every drawer and door perfectly functional, with the use of tweezers. She’s made a bird’s nest out of hundreds of stainless-steel pins. She has indigo-dyed silk fabric using a traditional shibori-zome technique, stitching the fabric with cotton thread and intertwining it with rope before arranging it, at the Fabric Workshop in Philadelphia, into a rippling umbilical form on a low, square altar draped with white linen. As a gift for a friend, Kazumi made a tiny oval “Box of Wisdom” out of cherrywood and copper nails, in which she placed utensils sculpted out of her wisdom teeth, on a pillow of her hair. For another friend, she carved an achromatic flute, tuned to the key of C, out of the leg bone of a deer. She once made a “temporal drawing” of fireflies aglow in a ring-shaped wire structure covered with tulle netting. This “happening,” as she calls it with a Fluxus echo, has its roots in a family memory: the night the war ended in Japan, a group of girls that included her mother, only a teenager at the time, couldn’t bear to wait for the bus that would pick them up the next morning from far out in the countryside, where they had been evacuated, and so they set out at midnight, walking the long, dark road home, guided by the silent, pulsating glow of fireflies. Kazumi also draws with ink made from coffee and tea leaves. Some years ago, when I first visited her studio, she showed me a series of twelve tea-ink drawings she had completed, each image filling a specific portion of a ten-by-ten-inch paper sheet and summoned from a particular memory of her Osaka childhood. (She moved to New York in 1987, at age twenty-five, but is still reluctant to trade her Japanese passport for an American one.) She had expected the pictures to gradually fade with time, turning the weeks and months she had spent on each drawing into an aesthetic meditation on temporality and evanescent memory. But she stored the drawings carefully and rarely brought them out into the light, and as time passed, the images showed no signs of aging, the umber lines and shades even deepening against the pale-yellow paper. Kazumi displayed the drawings for me on a table, each work covered with a square sheet she flipped, like the page of a book, to reveal the picture underneath, and then covered it again before moving on to the next image. The order of the drawings was deliberate, the kinds of tea leaves used for each drawing less so, but varied. Due to the small, intimate scale of the work and the act of turning each sheet to view the next unexpected image, it felt like an intensely private experience, akin to reading someone’s diary. And yet the detailed simplicity and finely measured strokes, the shifts in perspective and distance, the repetition of certain ritual objects, the specificity of the flowers, the changing position of the drawing on the page, which sometimes only filled a small part of the square space—all of these aspects spoke to the work’s art. It brought to mind the double-leaf butterfly mounting of the classical Chinese album, an art form that emerged during the Tang as Buddhist sutras were being translated and passed around. Small, elusive, delicate, portable, the Chinese album merged poetry, calligraphy, and painting into a connected, serial practice of reading and seeing. Traditionally, these albums consisted of a sequence of images on a single—or mixed—genre or subject, such as flowers, birds, animals, human figures, views of a landscapes. The form sought to encompass the world in, say, a stalk of bamboo. Shitao’s Returning Home took the Chinese album into a new realm (it can be seen, no doubt, as a model of what it means to be avant-garde, to borrow a phrase from David Antin). In it, he pairs twelve paintings with twelve poems, alternating images of flower and plants with landscape views, while changing the calligraphic style of his poems according to the content and style of the paintings, or vice versa. A tiny wash of color doesn’t appear until the fifth leaf, on the face of the lonely journeyman, squinting from the cold in a skiff. Sometimes a poem only fills a small section of a leaf; other times it fills half a leaf or the full leaf. Shitao’s album is an intensely personal work—one created at a tumultuous point in the life of the poet-painter, who was born a refugee the year the Manchus took over the Ming regime and who, after living almost forty years as an itinerant Buddhist monk, traveled to Beijing to accept the honor of a second audience with Emperor Kangxi but quickly became disillusioned with the “floating world” of the capital. A “ten-fold bitter coldness” overwhelmed him as he made his way home south to Yangzhou in 1692. He would make his album in late 1695, during another period of wandering. At some point early on, I decided on a loose renga-like structure. Renga, that Japanese linked verse form abused by so many poets through the ages. As Hiroaki Sato, who has translated my poems into Japanese, writes in his upcoming book on haiku, renga traditionally alternates 5-7-5 and 7-7 syllable verses up to fifty times, for a total of a hundred verse units. It is normally composed by two or more poets. In in this case, Kazumi became the other poet, her images preordained verse units, so to speak. All the rules associated with renga I either adapted, ignored, or threw out the window, instead choosing a square field as the formal structure for each poem, spacing the lines within the field, the spaces determining the rhythm of the lines. It is a structural form I had used before when translating classical Chinese poetry, though here I widened the field to a consistent six inches (save a three-line opening poem), which seemed to work as a nice visual inner frame to the ten-by-ten-inch square sheet on which it was set. The placement of seasons, flowers, and such largely depended on the order of the images. And as readers can see, I followed a basic rule of linkage where the end of each poem directly foretells the image that follows it, while each poem dwells on the image it faces. This created an overall “heavenly” circular structure in conjunction with the “earthly” square page. Our conversations became an important part of the collaboration. Kazumi has vivid memories of certain fairy tales and folktales her mother told her as a child. I didn’t want to fabricate, or project, any imagined memories into the narrative of her drawings, so absorbing the tone and story lines of these tales became an intuitive way for me to enter the images’ childhood space. When asking her about some of the specific objects in the pictures, like the talismans and cabinet shrines (drawings not included in the issue), she told me that her mother has been a longtime follower of Tenrikyo, a religion strongly influenced by both Shintoism and Buddhism. I discovered it was a fairly new religious practice, about a decade younger than Mormonism, founded in the nineteenth century by a peasant woman, Nakayama Miki, whose divine revelations are recorded in her Ofudesaki: Tip of the Writing Brush. Tenrikyo’s primary teaching is that the body is “a thing lent, a thing borrowed” from God the Parent, and so through hinokishin, or “daily service,” one can awaken the “divine intention” within us and attain the Joyous Life. To me, this connection felt like the golden thread that invisibly tied everything together—image to image, theme to theme, object to object—for all of the drawings were recalled and transmuted beneath the tea-infused tip of Kazumi’s brush. Words could be drawn into “divine intentions” (to riff on Mallarmé), and the sensations that arose from patient looking could allow meanings to ripple out in the wake of the words, in the empty spaces, like the musical phrasings in Tōru Takemitsu’s “I Hear the Water Dreaming.” At least this is how it feels thinking about the collaboration in retrospect. Some adjustments were made for publication in The Paris Review. Six of the final twelve pairings, plus the three-line opening poem, aren’t included. I also adjusted the layout and line breaks of each poem to fit the skinnier trim size of the magazine, and at the editors’ request, cheated the linkage in the middle of the selection to stitch the first three poems of the series with the last three poems. Some might feel this wrong to do, but the square field of the poems gives the poetic sequence a flexibility of form that made such an adjustment possible. We also had to leave out Hiroaki Sato’s Japanese translations—these were the last elements added to the album and have become a crucial part of the whole, image and word returning “home / no home” to the original source—drawings, poems, and translations circling a memory space sealed with perpetual silence. Jeffrey Yang is the author of Vanishing-Line and An Aquarium, winner of the PEN/Joyce Osterweil Award.